It was a snowy Saturday and we were anticipating the final episode of Season 5 of Downton Abbey. What better way to get in the mood than a "Full English" as they call a big breakfast in Britain. 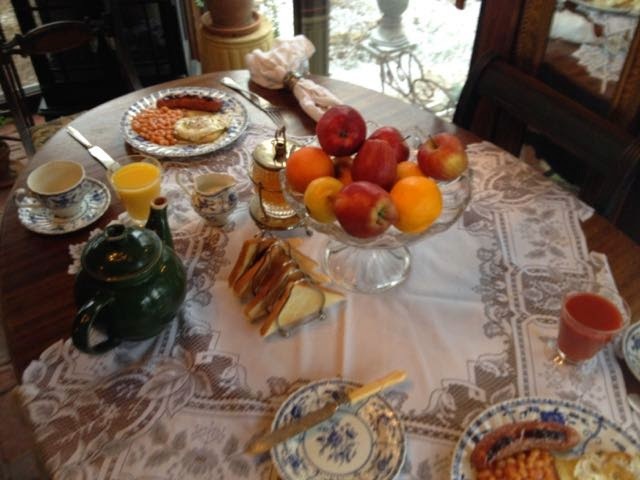 Alas, not taken on a tray in the bedroom as Lady Mary and Lady Cora do but rather in the breakfast room. A lace cloth which seems so English and so cottagey (more downstairs than upstairs at the Abbey! ), a glass bowl of fruit (alas, all of the bulb blossoms are spent), a pot of tea, juice, toast and marmalade. 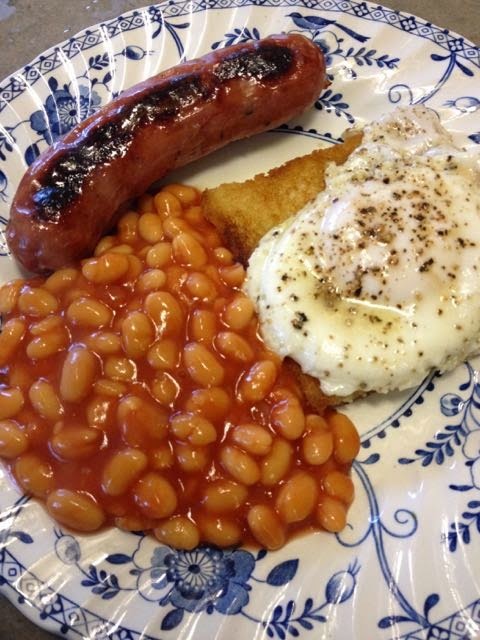 The Full English -- a sausage, a fried egg (basted soft) on top of a piece of fried bread and beans. The first breakfast of our first morning in England we were served beans with breakfast! I was a bit confused for beans from a can were either doused with molasses and brown sugar with some onion and bacon thrown in and baked until they were sweet and caramelized on top or taken from the can, heated up and served with hot dogs as a kid pleasing easy supper. But being the good little guests that we were, we dutifully ate them and felt that they weren't all that bad with eggs and sausage (sausage after all is kin to a hot dog). The coffee, on the other hand . . .
American VanCamp's beans won't work. You have to buy the British Heinz variety. It's in a blue can and we find it either at military commissaries or World Market (which in our area is far closer than any of the commissaries!) We stock up on half a dozen cans. And then we found out we can order it from Amazon! So our supply is assured! Another traditional part of a Full English is marmalade. Served at Linderhof in an English crystal and silver marmalade server. How do I know that it's really for marmalade? It says so on that little bit that sticks up. No other jam is found on the English breakfast table. Just the marmalade. 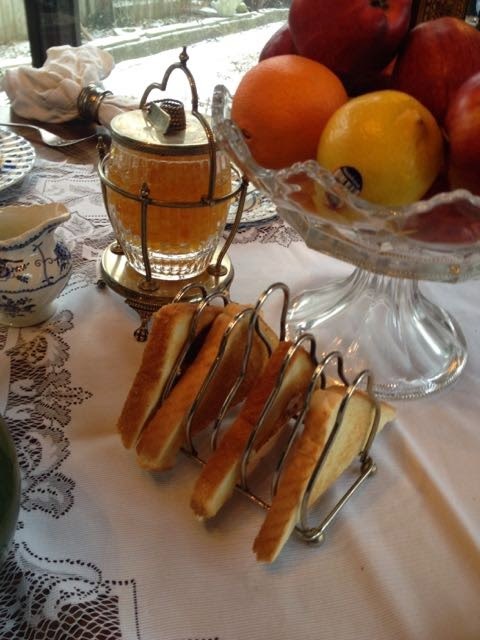 And the toast and marmalade is usually eaten after the breakfast. For there is a piece of fried bread under the egg to sop up all that runny yolk. The china is our breakfast china, Indies by Johnson Brothers, a plate of breakfast and a bread plate and knife for the toast and marmalade. Juice -- tomato for Husband Jim and orange for me and the Emile Henry "workhorse" tea pot full of P G Tips tea -- our only breakfast tea! It was a great way to start the "Countdown to the last Episode of Season 5 of Downton Abbey". We may not have dined at Downton but we breakfasted as they do! 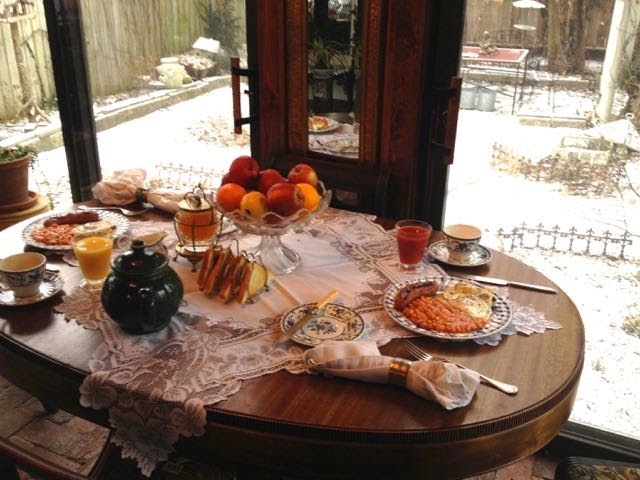 It's Thursday and I'm sharing my breakfast with Susan at Between Naps On the Porch for Tablescape Thursday. This was an awesome post, and so informative! Thanks for sharing. I don't think I could stomach beans in the morning, just cannot even think of it, but NEAT to know if and when we ever DO get across that pond to visit! Did you love Season 5 finale as much as we did? Sure tug at heart strings. I remember the beans and tomatoes for breakfast in England. So very different, but I tried it all. Your marmalade server is quite beautiful. I order my marmalade and tea from a little shop on line, very tasty. I do love a really good pot of tea.. I really enjoyed this post. I've lived all over the USA but never encountered beans for breakfast until I moved to New England. It's pretty much a standard in New Hampshire. I've lived in England, too, but oddly I don't remember beans for breakfast there. Beans on toast was common for a quick meal, but I don't remember beans for breakfast. I was young though, and it's likely we didn't eat out much for breakfast. My daughter and her new husband went to England for their recent honeymoon. She couldn't get used to the beans for breakfast and finally just told them to leave them off her plate. She said the English food, which usually gets a "bad rap", was really quite tasty! Martha, it must be a new thing in recent years to have beans with breakfast. Usually it is bacon and eggs and tomatoes sometimes with black pudding, or it was when we lived there. Beans was usually for a quick lunch or tea, on toast. Your mention of P.G. Tips brought a smile to my face, as we loved that advert with the monkey. Here in Canada, we drink Tetley's amongst others. I still think the strangest thing to have with breakfast, is pancakes. That was a dessert in England with lemon and sugar. You set a proper English table! It brought me back to when we visited London for a few weeks. I loved the breakfast. I just couldn't get over the big breakfasts the hotel served! Your marmalade server is beautiful! I love your dishes and the beautiful English country side setting!Perfect! 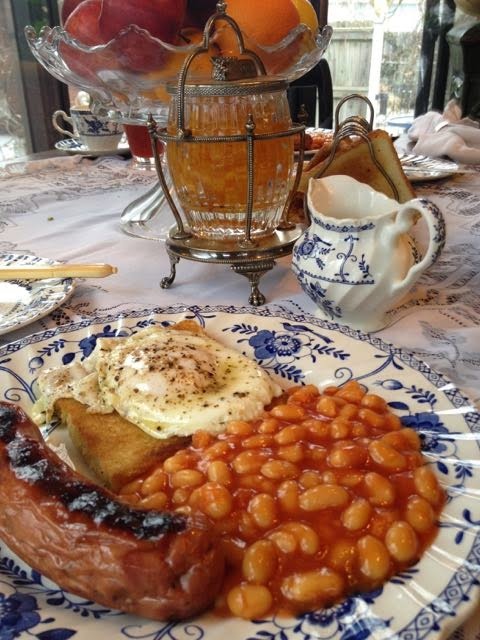 Such an interesting post, I had no idea that the Brits normally had on their breakfast menu beans. Of course, I have thoroughly enjoyed this season of Downton but have bought the entire series so I can rewatch until the next season, it is wayyyyy too long to wait but I will with great anticipation. I so enjoyed your post, they are always so inspiring. Gosh, Martha.... everything looks so lovely! Do you leave the marmalade in the jar all the time and if you do, where do you keep it? In the fridge? I've always wondered about such things, because I'd love to use all the beautiful antique holders and jars, but I wasn't sure what to do.